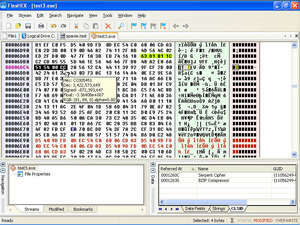 FlexHEX is an advanced hex editor for inspecting and editing binary files, logical disks, and physical drives. With FlexHEX you can inspect, modify, insert, search, or replace binary, ASCII, or UNICODE data. The numerous features make hex editing easy and straightforward: undo list browser, quick data viewer, file maps, modification tracker, typed data fields, string and GUID search, checksum computations, file comparator, and more. For security reasons, you should also check out the FlexHEX download at LO4D.com which includes virus and malware tests. Additional screenshots of this application download may be available, too.